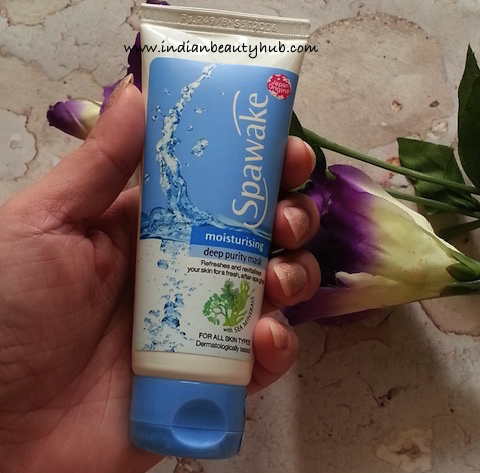 Hello everyone, my today’s review is about the Spawake Moisturising Deep Purity Mask. 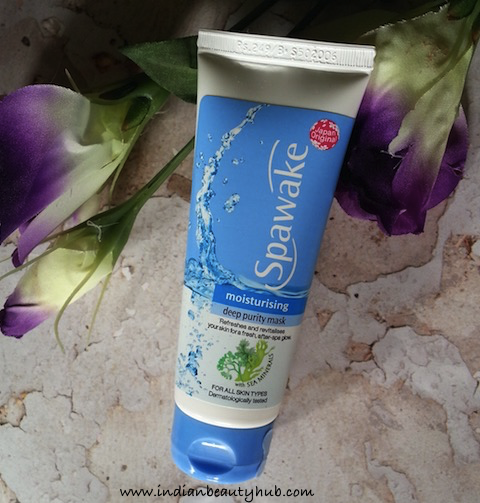 Spawake skincare brand is launched in India by the Japanese cosmetic company Kose Corporation and the range includes 7 face care products. 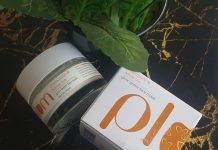 I’ve already reviewed 3 of them, you can read reviews here Spawake Moisturising Face Wash, Spawake Whitening Scrub and Spawake Moisturising Fairness Cream. 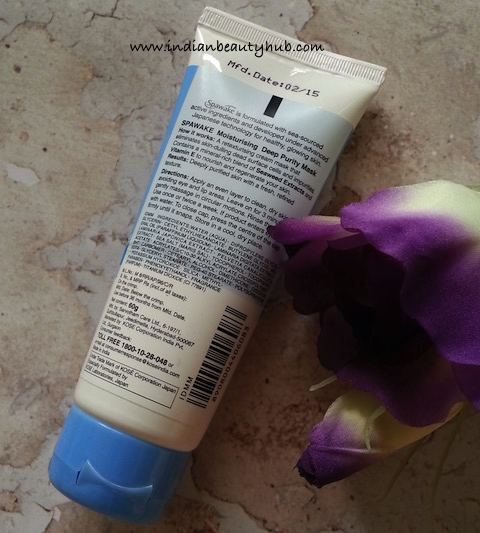 Packaging : Spawake Moisturising Deep Purity face mask comes in a white & blue plastic tube with a flip cap. The packaging is hygienic, sturdy and very convenient to use. The product related important information like claims, usage, ingredients, expiry date, etc. is also mentioned on the tube. Texture & Fragrance : The face mask comes in a milky white color and has a body lotion kind of texture, neither too thick nor runny. It has a mild floral fragrance which I find quite refreshing. The fragrance is not very strong so the people with sensitive noses need not to worry about its smell. Efficacy : After cleansing my face I take a generous amount of this deep purity mask and apply it evenly on my dry face. 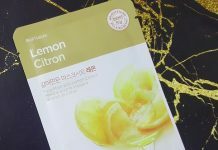 This cream based face mask spreads easily on the skin, it feels like you are applying a thick layer of moisturizer on the face. It feels very light on the skin and has no skin tightening effects. After keeping it on for 5 minutes, I massage it for 2-3 minutes and rinse the mask off with tap water. It comes out easily and leaves my skin clean & refreshed. After using Spawake Moisturising Deep Purity mask, my skin feels soft, smooth and visibly bright (although the brightening effects last for 1-2 hours only). I’ve oil acne prone skin and it doesn’t irritate my skin. 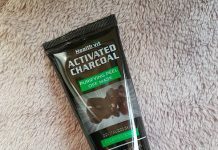 This mask is cream based so it feels a little heavy for my oily skin, but dry skin people are going to like this mask. 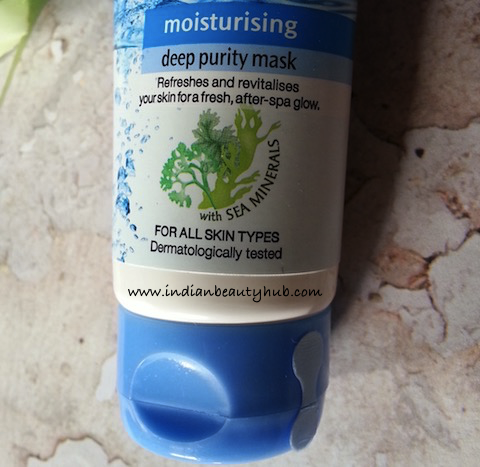 Price & Availability : The price of the Spawake Moisturising Deep Purity Mask is Rs.249 for 60g. 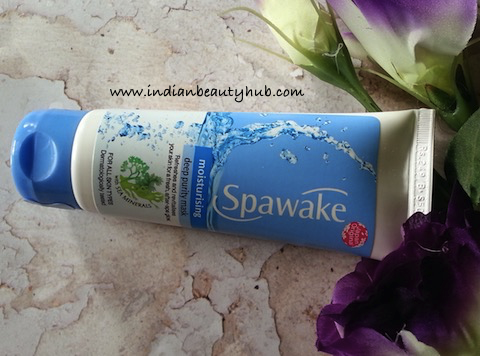 Spawake products are easily available at Big Bazaar or other stores, you can also buy Spawake products online from Myntra.com. Has sturdy, travel friendly tube packaging. Enriched with Seaweed extracts and Vitamin E.
Leaves the skin clean, refreshed and mildly glowing. 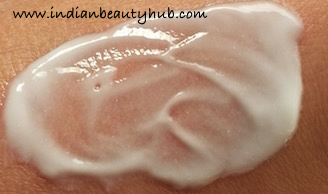 Nourishes the dull, dehydrated skin which makes it ideal for dry skin. A small amount is required during each use. Skin brightening effects don’t last long. Doesn’t control oil secretion, so it is not suitable for oily skin. Little expensive for the quality & quantity offered. Deeply purifying claims are not true. Shelf Life : 36 months. 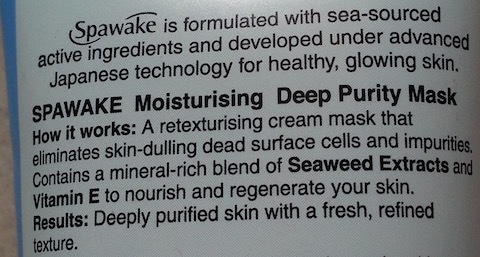 Overall Spawake Moisturising Deep Purity Mask is a decent product, nothing miraculous. 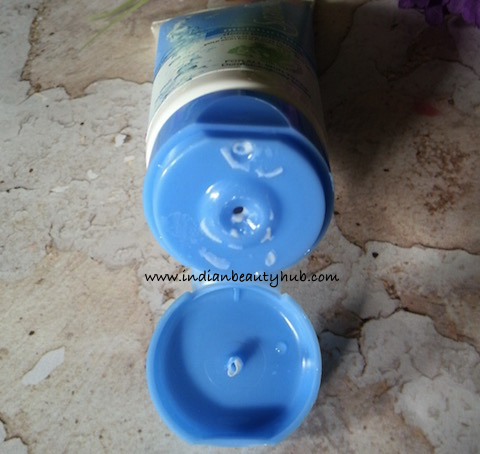 It is quite hydrating and gives clean, smooth and refreshing feeling to the skin. It does brightens the dull skin but effect doesn't last long. This is not a must buy, but normal to dry skin people can give this a try. Great Review ! I’d surely try this product in a minute after reading your review. Well if it a hydrating product then it is apt for me.